The Delaware Bay & Estuary Basin is located in eastern New Castle, Kent, and Sussex counties, and drains runoff from the Delaware Bay and Delaware Estuary. The basin drains approximately 520,960 acres, or 814 square miles, and encompasses the following watersheds: Delaware River, Army Creek, Red Lion Creek, Dragon Run Creek, Chesapeake & Delaware Canal East, Appoquinimink River, Blackbird Creek, Delaware Bay, Smyrna River, Leipsic River, Little Creek, St. Jones River, Murderkill River, Mispillion River, Cedar Creek, and Broadkill River. According to the U.S. 2010 Census data, Delaware's population increased from 783,600 people in 2000 to 897,934 in 2010, an increase of 14.6 percent. 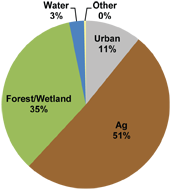 The land use break down is as follows; water 3%, other 0%, urban 11%, forest/wetland 35%, and agriculture 51%. With such a large and rapid increase in population, Delaware's landscape has changed dramatically. The trend in Delaware has been toward growth in unincorporated areas outside towns. In 1960, Delaware's population was more evenly distributed between incorporated places (cities and towns) and unincorporated, rural areas. According to the 1960 census, more than 39 percent of Delawareans lived in town and cities and almost 61 percent lived outside of towns. According to the latest population estimates from the U.S. Census Bureau, the population in incorporated places had fallen to less than 28 percent of Delawareans. More than 72 percent now live outside town and city limits. Delaware's population is projected to grow by more than 200,000 people between 2005 and 2030. The state of Delaware has a stake in how and where growth occurs. Unlike most other states, Delaware provides most services and infrastructure throughout the state, social services, prisons, roads and transit, police force, about 70 percent of school funding, 50 percent of library construction funding, and 60 percent of paramedic funding. There have been a number of studies, both on-going and short-term, of the Delaware Bay and Estuary Basin's flora and fauna. Fish and waterfowl are probably the two best-studied groups of species. Annual waterfowl counts date back to 1955, with more than twenty years of species-specific counts. Fish species were inventoried for all of Delaware's major streams in 1988, and summarized in two reports funded by the Federal Aid in Fisheries Restoration Act. The Delaware Division of Fish and Wildlife's Nongame and Endangered Species Program has conducted ongoing studies of some of the Basin's rare and declining species. The Federally Endangered Delmarva Fox Squirrel, once found in the forests of Delaware, was extirpated from the entire state. Reintroductions have been moderately successful in eastern Sussex County. The Delaware Natural Heritage Program (DNHP), part of the Division of Fish and Wildlife, conducts on-going inventories of natural communities as well as rare and declining species, (e.g., state and globally-rare plants, birds, insects, mussels, reptiles and amphibians). It maintains a database, both electronic and manual, of its findings throughout the state. The DNHP has never conducted a comprehensive review of the status of biodiversity in the Delaware or any of Delaware's Basins. But from data that have been collected, it is commonly accepted that an alarming number of species which were once common are now found at only one or two locations, or are extirpated entirely. Of the fifty states, Delaware has been estimated to have lost the highest proportion of its native flora. There are 58 species currently classified as "Delaware game animals" and managed by the Division of Fish and Wildlife (F&W). Among these species are 44 birds, 11 mammals, 2 reptiles, and 1 amphibian. All of the mammals, reptiles and amphibians, as well as 6 bird species, are year round residents. The remaining 38 bird species are classified exclusively as migratory and fall under the jurisdiction of the U.S. Department of Interior. The whitetail deer (Odocoileus virginianus) is native to the Delaware Basin and has adapted and thrived in the human altered habitat. Deer damage to agricultural crops has become a serious concern within Delaware. The Basin includes a few of the top deer management zones in terms of the number of crop damage complaints and severity of damage. Since 1992, the deer harvest within Delaware has continually increased, with some years significantly higher than others. The overall statewide increase during this time period averages 36 percent. Because of its strategic location, the Delaware Basin and its wetlands and associated uplands are extremely important to waterfowl and other wetland dependent migratory birds in the Atlantic Flyway. The wetlands across the Basin are regionally small but when interconnected form a critical route for birds that migrate between and/or winter in the Delaware and Chesapeake Bays. For this reason, conservation agencies place the highest priority on the protection, restoration and enhancement of habitats that serve as wintering areas or reduce fragmentation of prominent migration corridors for migratory birds. The Delaware Basin provides unique habitat during migration for high priority species designated by the North American Waterfowl Conservation Act (NAWCA) which includes the Black Duck, Mallard, and Northern Pintail, and is a focus area for the Atlantic Coast Joint Venture. The land area of the Delaware Bay and Estuary Basin is contains 520,960 acres, of which about 44% is used for agriculture. Agriculture is Delaware's top industry, and poultry is the primary agricultural product; it is the largest animal based industry in the State. Sussex County is the number one broiler-producing county in the nation, with over 262 million broilers/roasters grown in 1995. The dairy industry is the second largest animal-based waste generator in Delaware. Delaware's Department of Agriculture records indicate that approximately 100 registered dairy farms in Delaware are currently in operation; however, overall, dairy farms are not increasing in numbers. Production reports also indicate steady increases in total milk production by farm, as well as milk produced per cow. Delaware's swine industry is currently undergoing major changes. Delmarva is experiencing the arrival of integrated swine operations, similar to those seen in the poultry industry, and contract-growing systems in Delaware are possible in the future. While producer-numbers may decrease in Delaware, Delmarva may actually experience a net gain in the number of sows located in the region as the larger farms become more prevalent. Operating conditions in Delaware vary widely, with some hogs raised on dirt lots, and others raised in total confinement. Environmental impact of dairy, swine, and beef manure may be of concern on a site-specific basis, but is of relatively less concern than the impact from poultry. Dairy operations exist throughout the state. Beef cattle operations exist throughout the state but the number of operations increases to the south. The swine industry is mostly in Sussex County, aggravating the existing problem of excessive nutrients in the county. Water quality sampling and research from demonstration projects throughout Delaware indicate a strong need for concern about the fate and impact of nitrogen, phosphorus, and bacteria on surface and ground waters from agricultural sources. According to the Delaware Guidelines for Animal Agriculture, manure can be a valuable agricultural by-product if managed properly. Manure contains three major plant nutrients - nitrogen, phosphorus and potassium, as well as essential elements like calcium, sulfur, boron, magnesium, manganese, copper and zinc. Applying manure to fields provides valuable plant nutrients, improves soil tilth, aeration, and water-holding capacity, decreases soil erosion potential, and promotes the growth of beneficial soil organisms. Many manure application systems fail to fully utilize these nutrients. For example, applying manure in excess, or at the wrong time, or improperly handling it, may release nutrients into the air or water. Instead of only providing nourishment to the crops, the nutrients also become pollutants. The major concern is that excess nitrogen may leach through the soil and into the ground water. Accordingly, nutrient management in areas dominated by animal-based agriculture is a major nonpoint source pollution issue. The Delaware Nonpoint Source Management Plan calculated a statewide nutrient budget showing nutrient excess of 15,288 tons of nitrogen/year and 10,079 tons of phosphorus/year. According to DNREC, chemical fertilizers alone are applied at rates greater than the calculated crop acreage requirements. When combined with chemical excesses, organic fertilizers, especially manures, become part of the overall problem. DNREC (1995) suggests that chemical fertilizers are more evenly distributed throughout the state and are less of a concern than manures because the manures are not evenly distributed. Manure does not lend itself to inexpensive, easy transport due to its bulk, and thus has a tendency to be land applied in close proximity to the animal operation. The animal production industry, in particular the poultry industry, is not spread out, but rather, is concentrated in specific areas. Transport of manures away from these areas is limited, and cost prohibitive if transport distance is greater than fifteen miles (DNREC, 1995). Another management conflict arises when considering the N and P ratio in poultry manure. Applying poultry manure at rates that meet crop nitrogen requirements results in over-application of phosphorus. Land application of animal waste can add more P to soils than is removed in harvested crops, resulting in a long-term accumulation of soil P. Phosphorus buildup in Delaware soils has been documented by the University of Delaware's Soil Testing Laboratory. A summary of thirty-seven years of soil data at the Laboratory shows that soil phosphorus levels have been steadily increasing in many areas. In 1994, 72 percent of all commercial crop soil samples received had a "high" or "excessive" level of plant available phosphorus (no phosphorus fertilizer recommended). Twenty percent of all commercial crop soil samples from Sussex County had double the optimal level of phosphorus. Previous research in other mid-Atlantic states indicates that it can take from 10 to 20 years, with no additional application of P, for normal cropping practices to deplete soil P from excessive to optimum levels. Water quality impacts and nutrient loadings to surface waters depend on management practices. Reports commissioned by the Center for the Inland Bays provide values for nutrient loadings to surface waters from agricultural land. University of Delaware researchers have completed studies of agricultural practices, manure nutrient content, and other nutrient management issues. Accurate values do not exist for nutrient loading reduction resulting from implementation of best management practices. The Natural Resources Conservation Service does have values that are used for national reporting but those values should be used cautiously, considering the meaning of those values. A number of management, weather, and geographic variables can dramatically affect values. Also, evaluating individual management practices may not accurately portray overall reductions. For instance, storing manure in a shed is important to reducing nutrient pollution and some loading reduction estimates have been developed. However, if the stored manure is then improperly applied to the land, no pollution reductions have actually occurred. Storage, by itself, does not remove nutrients; it simply prevents the transport. Improper land application then allows that transport to occur. 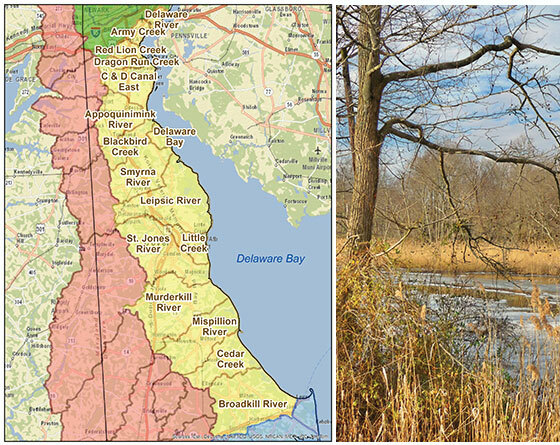 The Delaware Estuary Watershed has three sites listed in the Site Investigation and Restoration Section database. Two sites are state-fund lead (HSCA) sites and one site is listed as a Formerly Used Defense Sites (FUDS). If you would like to view reports for any of the sites in the SIRS program please follow the link the DNREC Environmental Navigator to search by map for the Delaware Estuary Watershed. Before the last ice age, ocean waters covered most of what is now Delaware. Over time, as the polar ice caps grew and continental glaciers drifted southward, sea level dropped significantly to a point about 400 feet lower than present-day sea level. Since then, with increasing global temperatures, the polar ice caps have decreased in size and the continental glaciers have retreated, causing sea level to rise to its current position. Although Delaware is located south of the maximum extent of the last continental glaciers, it is believed that the great weight of the glaciers depressed the land they overrode, causing the formation of a marginal bulge in the area of present-day Delaware. As the glaciers retreated, the earth's surface rebounded upward in areas to the north causing the marginal bulge previously formed in the area of Delaware to subside, leading to a relative rise in sea level. The current marine transgression began approximately 14,000 years ago when the polar ice caps began melting. The Delaware coastline at that time was approximately 80-100 miles east of its current location. A rapid rise in sea level--about three inches per year--lasted until about 7,000 years ago, when sea level was about 33 feet below its present level. Since then sea level rose at a slower rate until about 3,000 years ago when it reached its present level. As the ocean advanced across the continental shelf, it flooded ancient river valleys and moved large masses of Pleistocene sediments in a landward direction, overtopping previous lagoons and marshes. Over time, Delaware's coastline, including both the Delaware Bay and the Atlantic Ocean coastlines, began to evolve to its present-day configuration. The present coastline is moving landward and upward in response to longshore transport of sediments and storms. As sea level rises, waves attack the beach at higher elevations, which concentrates erosion on headland areas and works to straighten the coastline. At the same time, washover and blowing sand lead to the formation of dunes and a landward movement of the shoreline. The landward and upward movements of the beach and dunes cause the shoreline to roll over itself over time. Evidence of this can be seen on the beach following a coastal storm when peat deposits and remnants of ancient pine forests that were landward of the shoreline are exposed on the present beach face. Radiocarbon dates taken from stumps and peat exposed in the surf zone of Dewey Beach have found that those stumps date to 320-420 years before the present. This indicates that the barrier island in this location has completely overtopped itself in only 400 years. Landward movement of the shoreline caused by sea level rise does not proceed evenly; it is episodic. For example, at Fenwick Island, between May 1977 and June 1979, the shoreline moved landward at an average rate of more than 30 feet per year, while, in general, Delaware's Atlantic coastline moves landward at a rate of one to three feet per year. Even with our incomplete understanding, it is obvious that significant geologic changes can and do occur within a single human lifetime. Almost all of Delaware's geological formations exist in the Delaware Bay and Estuary Basin, with at least twenty-two major units mapped within the basin. Several of these units are exposed, or outcropped, at the ground surface; the remaining units lie immediately below the surficial units, or subcrop, at various locations within the Basin. These units consistently dip to the southeast at a slope ranging from 15 feet to 90 feet per mile. Older formations dip more steeply and subcrop beneath the younger formations. The Delaware Bay and Estuary Basin lies entirely within the Atlantic Coastal Plain Physiographic Province. The coastal plain consists of a series of southeastward-thickening, unconsolidated sediments of Cretaceous through Holocene age deposited atop the Paleozoic and Precambrian crystalline "basement" rocks of the Appalachian Piedmont. The Basin can be subdivided into two physiographic regions: the coastal lowland belt and the inland plain. These regions can be distinguished by their elevations. The coastal lowland belt contains extensive tidal marshes which lie between sea level and 5 feet above mean sea level; these marshes are separated by narrow necks of higher elevation (up to 20 feet above mean sea level). The inland plain consists of flat highlands (between 25 and 75 feet above mean sea level in the study area), cut by relatively narrow, steep stream valleys. The coastal plain consists of a series of southeastwardthickening, unconsolidated sediments of Cretaceous through Holocene age deposited atop the Paleozoic and Precambrian crystalline "basement" rocks of the Appalachian Piedmont. The inland plain physiographic region lies to the west of the coastal lowlands, extending to the edge of the Basin. Generally the edge of the inland plain is marked by a rather steep rise from the coastal lowland to an elevation of 35 to 75 feet. The plain itself is relatively flat, sloping gently to the south. In general, it resembles a fluvial terrace, and in some areas, there are small, undrained depressions called "Carolina Bays" The elevation of the plain decreases from around 75 feet above sea level in New Castle County to around 35 feet in southern Kent County. The plain is interrupted by relatively steep valleys caused by headward erosion of the drainage streams. In some areas, tidal stretches of the streams reach all the way to the inland plain. Soils have played a critical and largely unrecognized role in terms of where people live and work. Throughout Delaware's history, the establishment of settlements has been made largely on man's perceptions of the inherent value of soils. Documents and history books hint at the relationship between settlements and the tilth - health of the soil. Soils were described in terms of their utility, function and their perceived productivity. As in most agrarian-based societies, social status and economic wealth, as well as land use patterns of development were indeed tied to the soils ability to produce food and fiber and the proximity of landscapes to water transportation. The geography (soils, landscape and direct access to water) of the Delaware Estuary and Bay Basin from the days of pre-colonization to today has provided much of the State's industries and wealth and will continue to do so for a long time to come. Some of the most productive farms in Delaware, some of which are still owned by the original families, are located within the Basin. Soil can be defined as a living, dynamic resource that supports plant life. It is made up of different size mineral particles (sand, silt, and clay), organic matter, and numerous species of living organisms. Soil has biological, chemical, and physical properties that are always changing. It is a three dimensional body that is bounded by air, water, and rock. While its upper boundary is clear and the margins can be tied to the ability to support vascular plants (including in water), it is the lower boundary that is often debated. Its depth can range from a few inches to several feet. The soil and landscapes of the Delaware Bay and Estuary Basin are the product of soil forming factors operating on surficial materials over geologic time. Factors influencing soil formation include parent material (geology), topography (relief), climate (temperature and moisture), vegetation, and living organisms (including man). The degree and intensity of soil development is dependent on the prevailing climate (temperature, moisture and wind) and biological agents (plants, living organisms) which it supports over time to develop soils which reflect the intensity and geographical distribution of the above factors. Topography in the northern part of the Basin is dominantly undulating and rolling with moderate dissection. In the southern portion of the drainage basin, flatter (slope gradients <1 %) landscapes dominate. This relief affects landscape distribution of soils, landscape distribution of moisture, erosion and alleviation patterns, and degree of soil development. The presence and height of the seasonal high water table also correlates to the surface of the landscape. The parent or initial geological materials also play a pivotal role in soil formation. The majority of the soils from the western edge of the watershed to a north-south tending scarp line developed from fluvial sediments belonging to the Columbia Formation. This Formation is a fluvial deposit consisting of tan, brown, or reddish brown, medium to coarse sand with scattered thin beds of pebbles and gravel. Thin, discontinuous beds of silt and fine sand are also present. In the northern portion, a thin (one to three feet) thickness of loess (silt sized, windblown) sediments blankets the Formation. The loess has given the landscape a gentle and smoother appearance as it blanketed the more eroded and truncated Columbia Formation. On the eastern edge of the Basin, ancient marine environments influence the pedology. These include geological formations such as the Hornerstown and the Calvert Formations. South of the fall line of the Piedmont and the Coastal Plains, the non-marine Potomac Formation also has a pronounced influence on the pedology. Tidal wetlands derived from Holocene sediments occupy the flooded and filled ancestral valleys along the eastern edge of the Basin. Very little interrelationships between soils and local geology are discussed in the literature as both are treated as two separate disciplines. There is a need to further coordinate and facilitate scientific research aimed at relating these two disciplines for the purpose of gaining a better understanding of the pedologic and geological interactions and relationships. This is particularly important in the refinement of sound science principles and the application of future policy decisions in many of the key land use activities and practices. The natural resources of the Delaware Bay and Estuary Basin provide opportunities for a variety of recreational activities, such as fishing, camping, hunting, and hiking. The forests, marshes and open waters of the Basin are popular destinations for many people, both native and visiting. Within the Basin there are 73,841 acres of land protected by state, federal or private conservation ownership. Within the Basin, there are four state parks, two national wildlife refuges, approximately twelve state wildlife areas, and numerous fishing access areas that provide a variety of opportunities for recreation. Recreational fishing in the Delaware Bay and its tributaries is a popular activity. In the Delaware Estuary, some of the commonly sought-after recreational fisheries include: striped bass, bluefish, carp, catfish, drum fish, summer flounder, white perch and yellow perch. Bluefish and summer flounder are the two most sought-after species in the Estuary. It is recommended that before fishing, individuals contact the Division of Fish and Wildlife for the most up-to-date information regarding fishing advisories for the Delaware Bay and Estuary.